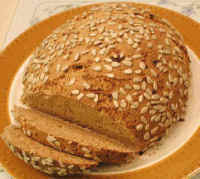 This is healthful, dense, whole grain roll for any sandwich or just to eat with a salad or meal. 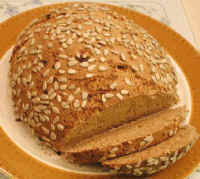 To make a less dense bread, use only one cup of rye flour and 3 cups of whole wheat flour. 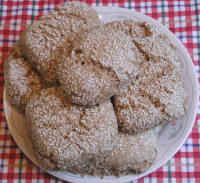 Add the ingredients in the order listed, with the exception of the Sesame Seeds. Place the dry yeast and flour in the mixing bowl or in the bread maker container. The total kneading time should be approximately 20 minutes. 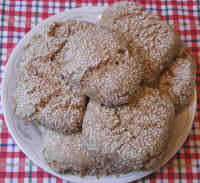 Place a thin layer of Sesame Seeds on a bread board or clean counter top. Place the dough on the Sesame Seeds and form into a cylinder about 1/3 m. (12") long. Cut in eight pieces and reform into into rolls making sure that the the entire surface, including the ends are coated with the Sesame Seeds. Place on a baking sheet or pizza stone coated with a little corn meal to keep the rolls from sticking. Set the warming drawer of your oven to low, or the oven to a warm setting ±45°C (120°F). Be careful that the oven does not overheat. Place the baking sheet or pizza stone in the drawer or oven to raise the dough. When the dough is slightly over double the size, turn the heat up to 175-180°C (350-360°F). Bake for approximately 30 minutes. When the crust is firm, but not crispy, the bread is done. Remove the rolls from the oven.